With a swipe of his stick, Brad Marchand moved the puck less than a foot. In doing so, he authored another chapter of a tale that is becoming more and more epic by the day. And I use the word “epic” in the literal, literary sense. As in Odysseus’s 10-year journey home following the Trojan War, or Dante’s journey through Hell itself. 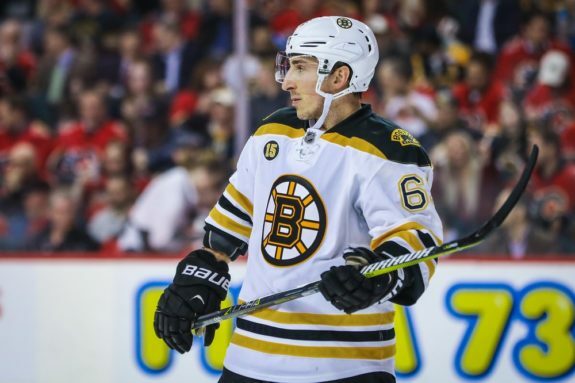 Though the exploits of one man and his hockey team may not quite compare to the great fictional works of yore, one would need to be half-dead to not have their breath taken away by Brad Marchand and the 2017-18 Boston Bruins. In a development that is becoming stranger than fiction itself, Marchand delivered the game-winning goal for the Bruins for the third time in as many games, all in less than one week. His go-ahead tally with just 22 seconds remaining in the contest was actually the least dramatic of the three, as it came in boring-old regulation whereas his previous two game-winners were delivered as a dagger through the heart in three-on-three overtime; once against the Montreal Canadiens, no less. More on the “Little Ball of Hate” later. Thursday’s last-second squeaker past the Philadelphia Flyers served was Boston’s sixth one-goal victory in the last 16 days, with four of those wins coming in overtime. The only two victories to be wrapped-up in regulation were Thursday’s and the exhilarating three-goal, third period comeback versus the Edmonton Oilers. 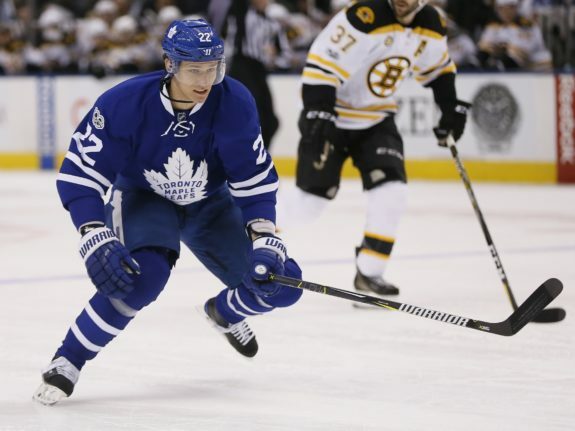 A red-hot Bruins team which had gone 29-5-4 over a three-month stretch traveled across Western Canada in mid-February, eking out four points in dramatic style versus two teams outside the NHL’s playoff picture and only after getting blown-out by the fourth-worst team in the NHL. Things worsened from there, with back-to-back losses against Toronto (a division foe nipping at their heels) and Buffalo (the second-worst team in the NHL). They had ceased to be good. So, like Harvey Dent, they made their own luck. 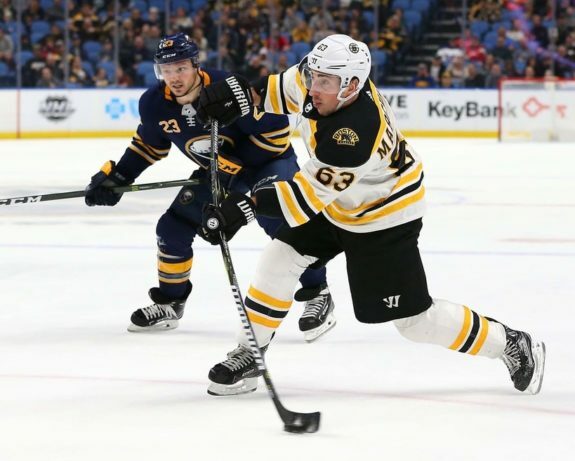 Just when things were seemingly heading south and the luster appeared to be wearing off of these Bruins, they delivered five-straight exhilarating victories in front of the Boston faithful. The lone contest that wasn’t an absolute nail-biter was an eight-goal blitzkrieg the B’s launched on the two-time defending champs in a game that featured just as much animosity as it did goals. With Patrice Bergeron and Charlie McAvoy leaving tractor-trailer sized holes in their respective wakes as they recover from injuries and the team enjoying a nearly 20-point cushion between themselves and the outside of the playoff bubble, the boys in Black and Gold would have a perfectly legitimate excuse to slow down. To slump. To succumb. On one hand, cracks have appeared in the facade. Boston has been dominated on the face-off dot in back-to-back contests and thee times overall since Patrice Bergeron went on IR five games ago. After cleaning-up the mess that had become of their special teams the units turned completely negative Thursday, as the penalty kill conceded a goal for the second-consecutive game while the power play struck out on three tries and also conceded a goal. But when it counts (zeroes on the clock) and where it counts (the final score), the results are same: Bruins win. Wash, rinse, repeat. Injuries to their best forward and best defenseman don’t sink them. Adding a contentious suspension to David Backes onto the injury list doesn’t sink them. Special teams meltdowns don’t sink them. Blown coverages, turnovers and loose play in their own end don’t sink them. Getting outshot and dominated on face-offs doesn’t sink them. Hell, having all of those things coalesce in one game can’t even take these Bruins down. They’re quite possibly the most resilient Bruins team these 32-year-old eyes have yet to see. As good and resilient as they’ve been, there’s no denying that the luck of the Irish has been surrounding the team as well. With St Patrick’s Day approaching, ask yourself if you sense something special about this group. Something magical. Something one can’t quite put their finger on. I do the best I can to not get ahead of myself. But I’d be lying if I said that I had yet to be gripped by a feeling of miraculous destiny as this team wins game after game in the most dramatic fashion possible. This season is starting to seem bigger than just being lucky or good; this is starting to look like a team of destiny. Part of the luck that has come Boston’s way of late has arrived in the form of a favorable slate of games at a convenient time. 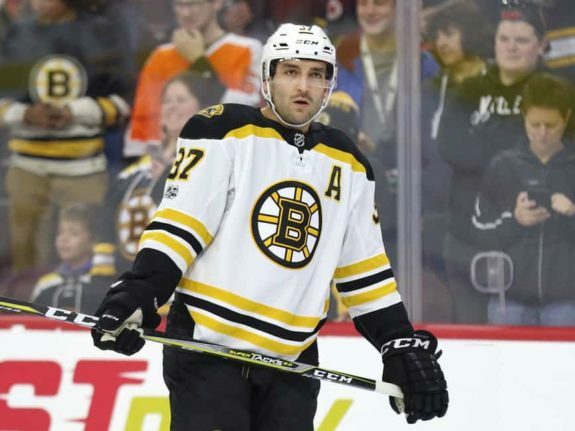 Bergeron’s injury happened to coincide with the onset of a six-game homestand. 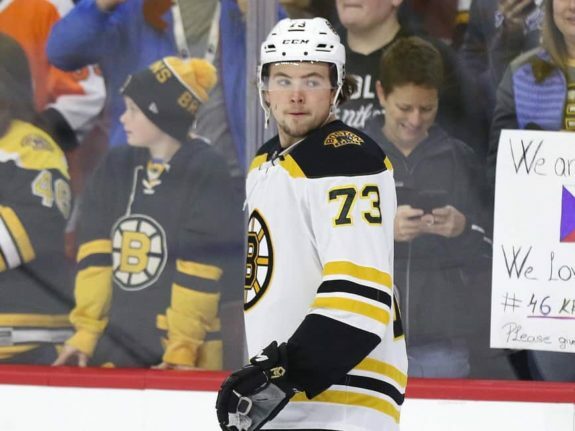 Charlie McAvoy’s injury occurred when the Bruins were just kicking off a stretch in which six of seven contests were to be played against teams outside the playoff picture. 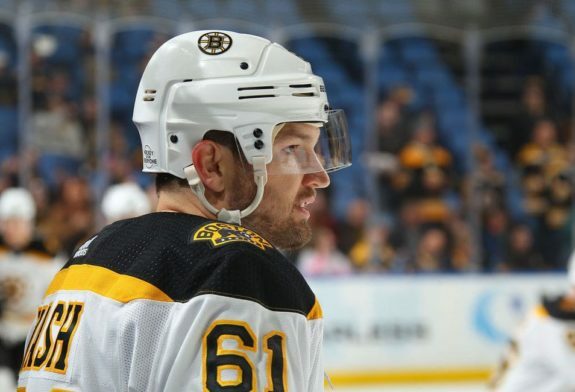 Backes’ three-game suspension will span just five calendar days thanks to Boston’s condensed late-season schedule, meaning little-to-no rust will accumulate on his game; if anything the 33-year-old veteran could probably even use the breather. That scheduling luck extends back a full month, as just four of the team’s last 15 contests have been against teams currently in the playoff picture; they’ve won three of the four. With their own record putting them at the top of the league and with so many contests against teams destined to see their season end immediately after Game 82, it’s hard to not come to the conclusion that, ” They should beat Edmonton. They should beat Carolina. And Montreal. And Detroit. Now consider the various absences Boston is currently enduring. Three of the victories over the teams listed above came without at least Patrice Bergeron, as did the team’s doubling-up of the two-time defending champion Penguins. The Flyers are comfortably in playoff position and they left TD Garden with zero points despite playing a Bruins squad also missing McAvoy and Backes. Doesn’t all of this confuse you and cloud your judgement as to how you should ultimately, accurately feel about these wins? Should you feel elated that your team is still winning games even without some of its best players or should you temper your excitement because the slate hasn’t been particularly difficult for the last month? Can one do both simultaneously? Clarity will likely come soon. Following Boston’s first clash of the season against the Florida Panthers on March 15, they will play eight of their next ten versus teams within the playoff picture, including two against Tampa Bay. Until then….I don’t know. Drink some Maalox. I’ve officially run out of adjectives or expressions to describe Brad Marchand. The best that I can come up with now is to just say “He’s Bobby Clarke” and be done with it. He has ascended to the top of the NHL food chain, right alongside the other greats of today’s game. If there’s a silver lining to Patrice Bergeron’s injury (aside from the rest he’s receiving prior to the playoffs), it’s that Marchand has finally been able to step out from his center’s shadow. The duo have been just that since the 2010-11 Cup campaign, with Marchand being viewed as the Robin to Bergeron’s Batman. And for quite a few years that was an accurate assessment of their respective roles and importance. The “Little Ball of Hate” is no sidekick, he’s the straw that stirs the drink. He has proven as much (in spades) without his all-world center across two separate stretches this season. In the five games since Bergeron’s most recent absence, the Halifax-native has five goals and nine points. In the five games that “Bergie” missed to begin the campaign his left winger produced three goals and six points. That gives Marchand eight goals and 15 points in ten games without his longtime linemate and friend; he’s actually scoring at a higher rate without Bergeron in the lineup. In the 14 games since returning from suspension he has eight goals and 17 points, with four of those goals being of the game-winning variety (three coming in overtime). His 61 points in 52 games give him the fourth-best points-per-game ratio in the NHL. Regardless of which team hoists Lord Stanley’s cup at season’s end, this season will, inevitably, end. And though the odds and basic math suggest that the Boston Bruins are much more likely to not win the Cup than they are to triumphantly lift it above their heads, the fact remains that through 65 games this season has already been vastly more exciting, promising, encouraging and unpredictable than any of us could have imagined just four short months ago. So enjoy it while you can. The odds may not technically be in Boston’s favor, but what does that matter to a team that makes its own luck?